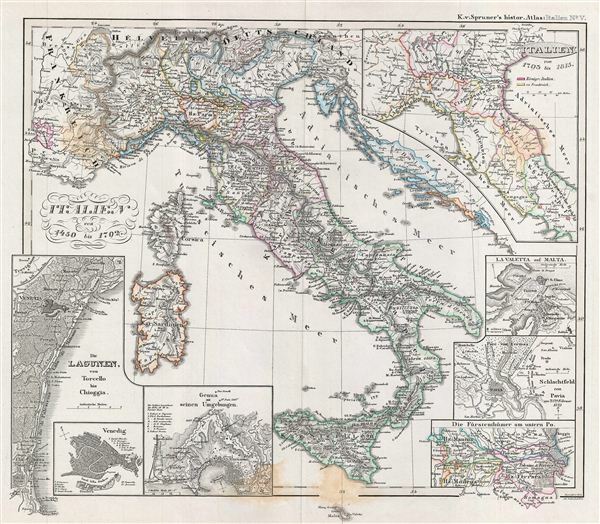 This is Karl von Spruner's 1854 historical map of Italy from 1450 to 1792. The map covers all of Italy from the area of Venice to Malta, including the islands of Sicily, Corsica, and Sardinia. The map also features seven inset maps, one on the top right corner, three in the bottom right corner, and three in the bottom left corner. These insets detail Italy from 793 to 1815, La Valetta in Malta, Battle of Pavia on the 25th February, 1525, the Principalities of the Lower Po, Genoa with its surroundings, Venice and the lagoons of Torcello to Chioggia. Between 1494 and 1559, Italy witnessed a series of conflicts. These were mainly disputes over the Kingdom of Naples and the Dutchy of Milan, but quickly devolved into a greater struggle for power and territory. February 15, 1525 marks the date for the Battle of Pravia, when Francis I was be defeated and captured. This led to an alliance between Christian and Muslim Monarchs when Francis' mother sent a mission to the court of Ottoman Sultan Suleiman the Magnificent, a move that would cause scandal in the Christian world. France eventually renounced claims in Italy, Burgundy and Flanders when Francis signed the Treaty of Madrid in 1526. The whole is rendered in finely engraved detail exhibiting throughout the fine craftsmanship of the Perthes firm. Prepared by Karl Spruner for publication as plate It V in the second edition of Justus Perthes' 1854 Historich-Geographischer, Hand-Atlas zur Geschichte der Staaten europa's vom Anfang des Mittelalters bis auf die Neueste Zeit. Very good. Blank on verso. Original centerfold. Original platemark visible. Minor spotting bottom center, upper right and upper left quadrants.